ï»¿ Iraqi Resistance Solidarity Network January 30th Update Report! Iraqi Resistance Solidarity Network January 30th Update Report! Editorial 1.Iraqi Resistance Report: Updated News Reports Compiled by Muhammad Abu Nasr , from the Editorial Board of the Free Arab Voice. 2.Iraqi Resistance Data Report Updates: 3.HamasOnline- Solidarity Gathering Held in Lebanon Honors Sheik Yassin 4.Loles OlivÃ¡n: Paper presented to the 2nd Cairo Conference (PDF) 5.On the Significance of the Martyrdom of Rim ar-Riyashi- Essay by Dr.Ibrahim Alloush, Editor of the Free Arab Voice, defending the use of women as Human Bombs ***En EspaÃ±ol*** 6. :: Diario de la resistencia iraquÃ­: Titulares: 25 a 27de enero 7. DeclaraciÃ³n de la II Conferencia Internacional de El Cairo:Con la resistencia palestina e iraquÃ­, contra la globalizaciÃ³n capitalista y la hegemonÃ­a de EEUU 8. Â¡ ORGANICEMOS LA DEFENSA DEL PRESIDENTE SADDAM HUSSEIN ! I would like at this time to thank the Socialist Arab Coalition of North America for it's efforts at rejecting Normalization of Relations with the Zionist Enemy, and for its assistance towards the just goal of building Pro-Resistance Popular Forces in the US. They have a website available at www.geocities.com/arabsocialistcoalition . Also, we will be working more towards converting our web based efforts into a foco point for building Pro-Resistance in the US. We are calling on your various organizations and personages to work with us towards building Pro-Resistance Events and Demonstrations in the upcoming year. We also are requesting that your esteemed organizations formalize written theortical statements against US Imperialism and Zionism and in favor of Resistance in Iraq, Palestine, Afghanistan, and around the periphery. This is an important step in kicking Pro-US sentiment and Zionism out of all of our movements, particularly the Anti-War Movement. While we favor unity, our unity can only exist within principled parameters. We are on the side of Arab/Islamic Resistance, and we call on our collegues to take up such a non-negotiable banner as part of their efforts towards social justice. We will still include news and views. Those who have been submitting articles to us, should continue to do so. Updated News Reports Compiled by Muhammad Abu Nasr , from the Editorial Board of the Free Arab Voice. American who had been on the river patrol. Josslyn Aberle, a spokeswoman for the 4th Infantry Division. was evacuated to a military hospital, where he died. who were in the possession of a grenade launcher, Aberle said. as two American Humvees were passing, but no injuries were reported. the mound of garbage before the American vehicles went by. for other possible explosive devices. tried to pass an American military convoy in Kirkuk. survived an assassination attempt â€“ the third such attempt in a week. target and hit a neighboring house but caused no casualties. confiscated 220 hand grenades, Aberle said. authorities found nothing to hold against him. prison, as-Samarra'i was never charged with any offense. on Sunday night when Iraqi Resistance fighters opened fire on him. in al-Basrah and then escaped. Spain and El Salvador are centered. forces in an-Najaf from getting into the area of the two attacks. occupation forces losses in casualties or destruction. since the defeat of the Japanese militarist aggressors in 1945.
located a mere 200 meters from the site of the explosion. cordoned off the street leading to where the explosion took place. officers in the Iraqi intelligence service in their possession. their capture, according to puppet Lieutenant General Hakim. they would take part in the Hajj pilgrimage had not arrived. them to Kuwait airport for a flight to Saudi Arabia have not come." officials and the possibility of finding a solution." our fate is to be." pledge in writing to "renounce violence." Special Report from al-Arab al-Yawm on Iraqi prisons. and Umm Qasr, near al-Basrah in the south. newspaper's edition for Tuesday, 27 January 2004. American forces charged with controlling the prison camp. million dinars from my house and arrested three of my sons." hands and feet were bound in iron chains. and have fainting spells which I am now seeing a doctor about." food, which he said was spoiled. Baghdadi, and parts of Abu Ghurayb prison camp. miserable conditions. They have no care, and were badly treated. and high-ranking Iraqi Army officers." visits from officials of the Red Cross Organization. on my home came as a total surprise." severity he managed to endure. interrogation sessions that no person could stand. connection with any attacks on the American occupation forces. justified by law or the principles of human rights. beaten and kicked and denied food and water for two consecutive days. wounded prisoners had subsequently died of their wounds. to be paratroopers belonging to the US 82nd Airborne Division. ambushed near Fallujah . . . involving two coalition vehicles." spokesman said he had no other details. a second blast when reinforcements arrived. indiscriminate US gunfire that followed the Resistance attack. Khalidiyah, damaging a Humvee and wounding three occupation troops. and began firing killing an Iraqi and wounding another." occupation troops whenever they come under attack. carried several injured people to the hospital. in the central Iraqi town of Bayji, the occupation Army said. occupation and its puppet so-called Interim Governing Council. headquarters at the Kirkuk airport." carrying "between 200 and 350kg of explosives." initially he had been killed. claims that only Iraqis were killed. maneuvered around concrete barriers in the street, witnesses said. California. "I am OK," she sobbed. "Just didn't want you to worry." blast, which occurred at about 6:30 a.m.
targeted, but confirmed it was a car bomb. wafting out of the puppet police building three hours after the blast. was woken up by the blast. moving at the time of the blast. "We were woken up by a very strong explosion. The glass fell on us. Belarus embassy and a puppet police station. the attackers fired from a car moving at high speed during the attack. their headquarters in the city. Iraqi Resistance Data Report for Sunday, 11 January 2004 through Saturday, 17 January 2004. The following report brings together data from two opposite sources. Humvee and a military jeep were destroyed. main highway left two American soldiers dead and wounded one other. Early AM: 3 loud blasts were heard in Baghdad. 500-1000 lbs. It left a crater 8 ft. deep by 15 ft. wide. 7:30 AM: Rocket attack on a US base southwest of Kirkuk. Headquarters in an-Nasiriyah. 1 puppet was killed and 2 were wounded. All of the puppet police were female. one of the first known attacks in this part of Baghdad. below, causing damage but no casualties. the puppet police at the checkpoint, killing 1of them. 11 AM: Mortar attack on PUK collaborationist party offices in Mosul. 2 attacks and 1 Iraqi was wounded. outskirts of Baghdad in the area west of the Mazra`ah District. from west of the US Kirkuk Airbase. 1 PM: Small arms attack on Iraqi ICDC Traitor soldiers in Samarra'. Resistance fighters fled in a vehicle. 1:30 PM: Small arms attack on a US convoy in east Mosul. 5:30 PM: Mortar attack on the Husaybah border checkpoint. 6:30 PM: Mortar attack on a US base west of Samarra'. the Baghdad Airport on the far southwestern outskirts of Baghdad. of Central Baghdad near the so-called Green Zone. 10 PM: Roadside bomb attack on a US patrol north of Ba`qubah. Kirkuk, damaging a US vehicle. No US occupation casualties reported. British troops shot at them, killing 3.
wounded. British troops and Iraqi Zionist police broke up the riots. Kirkuk. No damage or casualties reported. fighter mortar position near Balad. occupation troops was arrested in Tikrit. was arrested for in connection with this bomb. Bomb found 1 mile west of Riyad. Bomb was a 105mm round. was attached to a pole 2 feet off the ground. was rigged for command detonation. and connected to a box with an antenna. Bomb found on the railroad tracks near Iskandariyah. one tank and two military vehicles. wounded and destroyed three vehicles of various types. of smoke could be seen rising from the target area. all by US soldiers. There were 39 security incidents in Iraq today. The media reported only 10 of these incidents. 7 AM: Mortar attack on a US base near ar-Ramadi. traffic on the highway in east Mosul. Diyala Province near Balad Ruz. Iskandariya. Bombs were made of artillery rounds and a gas can. soldier, Staff Sergeant Ricky L. Crockett, and wounding 2 more. 10 AM: Roadside bomb attack on a US convoy northeast of ar-Ramadi. 10:30 AM: Mine attack on a US armored vehicle near as-Sadah. another Iraqi. 1 Ukrainian and 1 puppet policeman wounded. 12 PM: RPG attack on US troops guarding the al-Fallujah City Hall. Troops fired back, killing 2 Iraqis and wounding 4 more. 12:30 PM: Small arms on a US convoy on the highway near Miqdadiyah. near `Arab Dulem 9 miles south of the US Balad Airbase. arms attack followed the mortars. 6 PM: Rocket attack on the ICDC Headquarters in Abu Ghurayb. 9 PM: Rockets launched at unknown targets from so-called Sadr City. Kirkuk. Bombs were 155mm rounds and an antipersonnel mine. Bomb found in east Mosul. Bomb was multiple blocks of C4. arrested in connection with this bomb. a car alarm for remote detonation. Baghdad killing the crew of two pilots. forces, leaving two Bulgarian soldiers dead and five others injured. Three Iraqis were martyred and 10 others injured. an attack on an American military patrol in the city of Tikrit. wounded. A large part of the faÃ§ade of the hotel was destroyed. wounded. Four military vehicles were destroyed. these incidents were reported in the media. station. Resistance fighters escaped in a vehicle. the northern outskirts of Baghdad. off course and missed the intended target. highway east of Haswah. The car was riddled with bullets. Operation Center (CMOC) puppet office in Ba`qubah. a US civil affairs convoy 3 Â½ miles west of al-Fallujah. Iraqi Puppet Police Station in Iskandariyah. killing 2 Iraqis and wounding 3 more. along Highway 2 north of Baghdad. 2 PM: Fire truck stolen 5 miles southwest of ar-Ramadi. 2:30 PM: Small arms attack on a US patrol northeast of Taramiyah. fighters escaped in a car and a truck. from the east side of a canal across the water at the building. fighters, arrested 26 others and confiscated 4 vehicles. Bomb found in Tikrit. Bomb was made of several artillery rounds. Bomb found near Miqdadiyah. Bomb was rigged for remote detonation. wounded. A Humvee and a military jeep were destroyed. 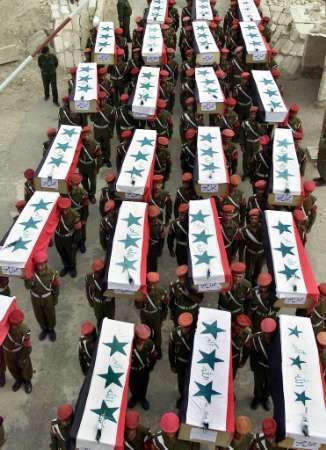 resistance fighters were martyred and 1 was wounded. 12:30 PM: Roadside bomb attack on a US patrol in Mosul. firing on the trucks, the Resistance fighters immediately escaped. 3 PM: Small arms attack on a US base in al-Huwayjah. 3 PM: Roadside bomb attack on a US convoy in Kirkuk. 3 PM: Mortar attack on a US unit east of al-Fallujah. 4 PM: Small arms attack on a puppet policeman in northern Mosul. 5 PM: RPG attack on a puppet police station in eastern Mosul. 5:45 PM: Mortar fire was observed in Tikrit. 6 PM: Mortar attack on a US unit in central Mosul. fired back, killing 1 resistance fighter and wounding another. 8 PM: Multiple RPG attack on a US armored patrol in Husaybah. 9 PM: Small arms attack on a Coalition convoy in ad-Diwaniyah. guarding a gas station in the Shari` ad-Dun District of Baghdad. station 3 miles north of Karbala'. No casualties or damage reported. puppets captured a vehicle the resistance fighters had used.